TB Joshua Banned In Ghana Over Holy Water Deaths!! Two men who allegedly slaughtered a soldier in a Woolwich street were known to security services, it emerged today as police swooped on a house in a Lincolnshire village. Officers raided the detached property early this morning just hours after the unidentified victim was hacked to death with meat cleavers as dozens of witnesses watched. The two men were shot by armed police officers and are today under arrest as they are treated in separate London hospitals. 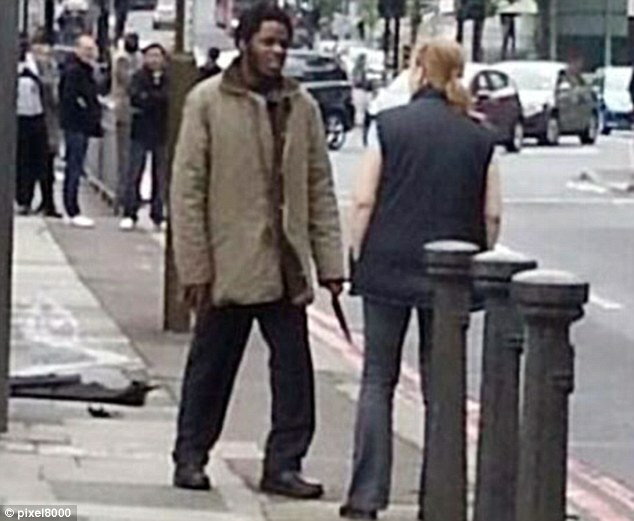 Today one of the suspects was named on internet forums and Twitter as Michael Adebolajo, the man seen ranting on video shortly after the murder. David Cameron revealed in a statement in Downing Street that the authorities will investigate exactly what the security services knew about the killers and whether the attack could have been prevented. ‘As is the normal practice in these sorts of cases, the Independent Police Complaints Commission will be able to review the actions of the police, and the Intelligence and Security Committee will be able to do the same for the wider,’ he said. A second search in the early hours of this morning concentrated on a house believed to belong to a woman related to Adebolajo in Romford, Essex. Detectives and forensic officers were examining the top floor flat belonging to Blessing Daniels. They were seen taking plastic boxes into the block. Other officers sat in a white transit van outside the estate. Michael Adebolajo, 28, and his unnamed accomplice are believed to have run down the off-duty British soldier with a Vauxhall Tigra as he walked back to the Woolwich Barracks at 2.20pm yesterday, crushing his body against a road sign. 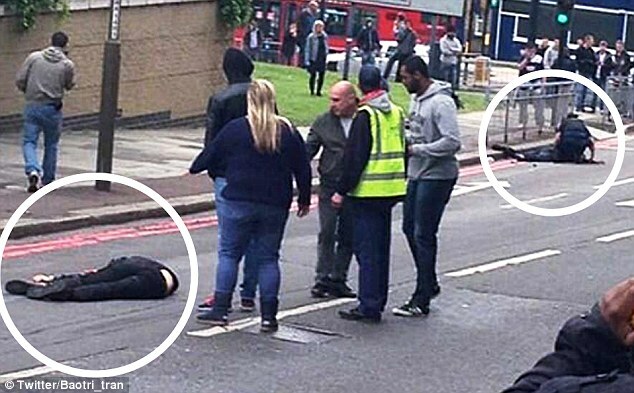 Witnesses said the terror suspects then 'hacked and chopped' at his body like 'crazed animals', before dragging his corpse into the middle of the road leaving a trail of blood. As they apparently tried to decapitate him they were chanting 'Allah Akbar!’ – an Islamic phrase meaning ‘God is great’ - and yelling 'this is what God would have wanted'. 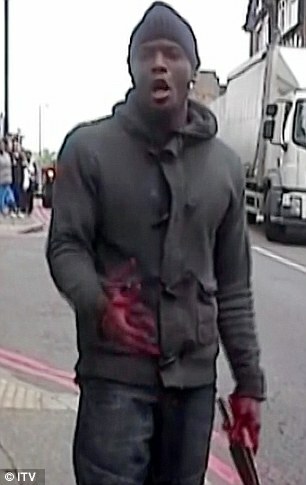 A blood-soaked Adebolajo, who was still holding a number of weapons in his red-stained hands, then ranted on camera in a clear London accent saying: 'You people will never be safe' before telling a passer-by they had not fled because they were waiting to 'shoot the police'. Within 20 minutes armed officers arrived and the fundamentalists charged at them wielding firearms, knives and a machete. Police opened fire, shooting six bullets, leaving one seriously injured. 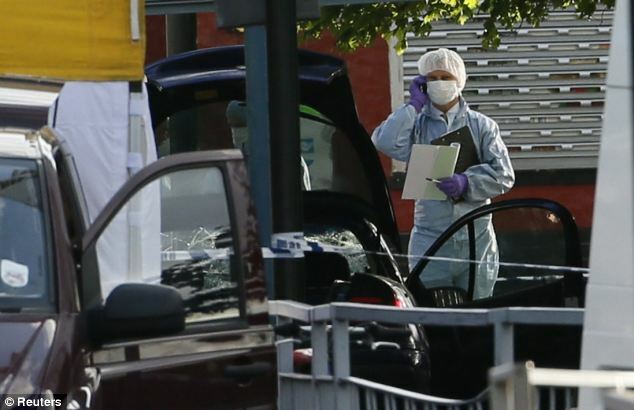 The pair remain under armed guard in two separate London hospitals. It is understood the men, who are being treated in separate hospitals while under arrest, are most likely to be British citizens of Nigerian descent who have converted to a radical form of Islam. However, they are not thought to have links to terror groups based in Nigeria, such as the jihadist militant organisation Boko Haram. David Cameron today said: 'We will defeat violent extremism by standing together, by backing our police and security services and above all by challenging the poisonous narrative of extremism on which this violence feeds. 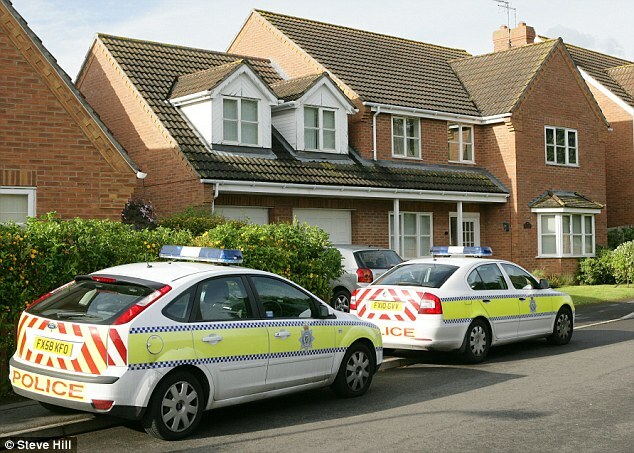 Police were today seen outside a £365,000 detached house in a Lincolnshire village where they raided a home where Adebolajo is listed as having lived in the past. There was no answer at the address believed to be that of Adebolajo's father, named by neighbours as Anthony Adebolajo. 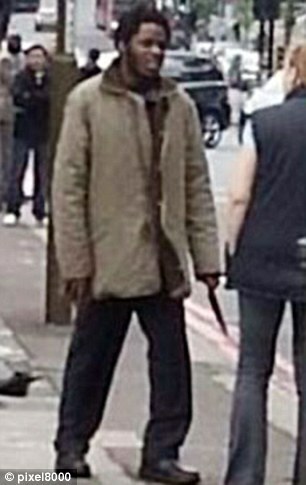 Mr Adebolajo, 56, is believed to be a trained nurse now working in a managerial capacity within the NHS. Shortly before midday police extended the cordon to take in the entire road and a handful of surrounding roads and cul-de-sacs. No visible evidence of searching at the house could be seen, with the curtains remaining drawn and no movement in or out of the house. Later in the morning, plain clothes officers, thought to be from the Metropolitan Police, arrived at the modern estate and the house and driveway was sealed off with police tape. 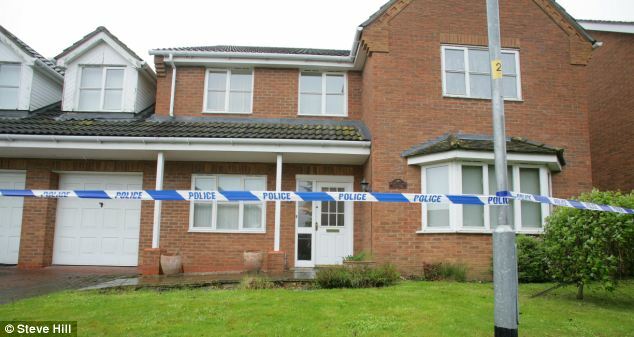 An officer at the scene described the property as a 'crime scene'. Mr Adebolajo bought the property in 2002. At one time a woman who wore a burka was thought to live with him. They believed he had up to four grown up children, although few if any are thought to have stayed at the house for any period of time. Michael Adebolajo was listed as being a resident there in 2004, shortly after the family moved in. One nearby resident said: 'I know his family have ties to London, but whoever is at this house is very secretive. Neighbours said the house has been home to the same family for about a decade and the blinds at the house were today closed. 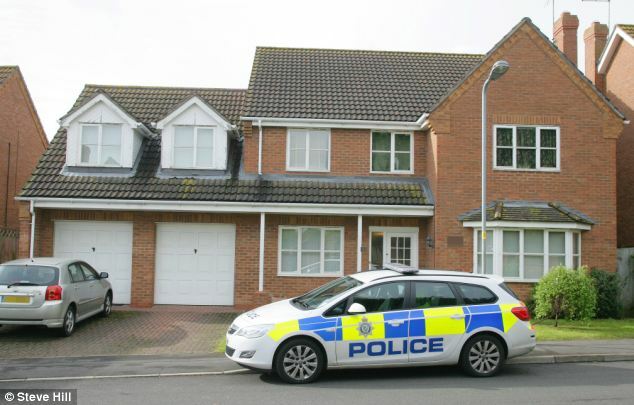 A spokesman said: 'Lincolnshire Police can confirm that the Metropolitan Police executed a search warrant under PACE at an address in Lincolnshire. A man who claims to know Abedolajo from their time at Mulgrave Primary School today described him as 'a nice man with impeccable character'. Anjem Choudary, who led Islamist group Al Muhajiroun - the banned forerunner to Islam4UK wher Adebolajo ofen appeared with other radical protesters - said he recognised him from TV footage at the scene. Choudary said: ‘I went to the same primary school as him in Woolwich, Mulgrave, and grew up in the same area and he came to the local mosque - it was a peaceful community with lots of Muslim people from Somalia and Pakistan. I didn’t know him that well so I can’t say where his family was from. ’He converted around 2003 to Islam, before I met him and I knew him as his convert name ‘Mujaheed’ when he used to attend our demonstrations and lectures. I last saw him in 2011, he was a very nice man with impeccable character and nothing unusual about him. Choudary suggested that it was possible the attack was motivated by British government foreign policy in the Muslim world, and that this may not have been an isolated incident. He said: ‘We are a very politicised community. Some people are angered by draconian measures such as ‘stop and search’ and restrictions on free speech. ‘There is a chance of more lone wolf attacks happening again due to these draconian measures. This morning a group of military wives - some pushing prams, laid flowers at the main gates of the barracks to pay their respects to the dead soldier. One of the women, in her 20s, who did not want to be named, said: 'We are a group of military wives. 'We live just outside the base. We are all just very numb at the moment - shaken up and very shocked. It could have been any one of our husbands. 'He was a young guy who cared very much about his job, like they all do. I think he was in training. The atmopshere is very quiet. No one really wants to talk. No one knows what to say. 'We are very sad and feeling quite raw at the moment. A lot of our husbands left the country this morning to go to Kenya. I don't believe he was due to leave. After the killing, the man believed to be Adebolajo is alleged to have declared: 'you and your kids will be next'. In a chilling rant captured on camera, the knife-wielding man declared: 'The only reason we have killed this man today is because Muslims are dying daily by British soldiers. The man with blood on his hands said 'you people will never be safe' as he launched an incredible rant. In the video footage, obtained by ITV News, he said: ‘We swear by the almighty Allah we will never stop fighting you until you leave us alone. 'We must fight them as they fight us. An eye for an eye, a tooth for a tooth. 'Do you think David Cameron is going to get caught in the street when we start bussin' our guns? You think politicians are going to die? 'No it's going to be the average guy, like you, and your children. He added, in the video obtained by ITV News: 'Remove your governments - they don't care about you. You think David Cameron is going to get caught in the street when we start bursting our guns? You think politicians are going to die? 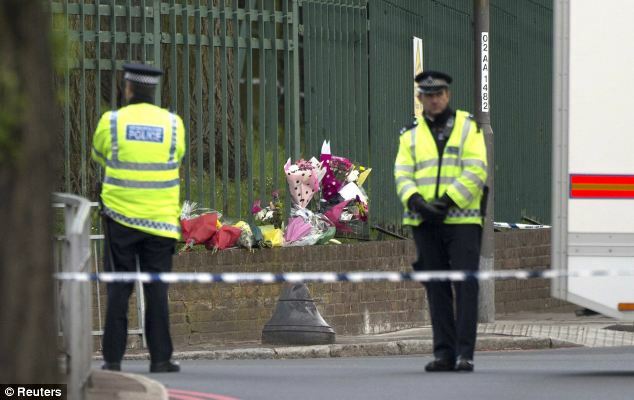 The serviceman was murdered yards from the barracks in Woolwich, south-east London, yesterday. In broad daylight, an attacker and an accomplice repeatedly stabbed and tried to behead the young serviceman in front of dozens of passers-by. 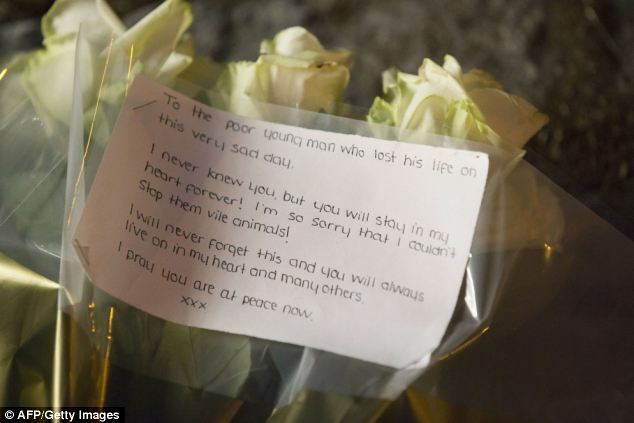 Throughout the frenzied attack the two killers shouted ‘Allah Akbar’ – Arabic for ‘God is great’ – then demanded horrified witnesses film them as they ranted over the crumpled body. The two attackers in their 20s, waited calmly for armed police to arrive before charging at officers brandishing a rusty revolver, knives and meat cleavers. When the old pistol was shot towards police it backfired and blew the thumb off one of the men. Moments later they were cut down in a hail of bullets believed to be fired by a woman marksman. Last night both men were being treated in hospital for their wounds. 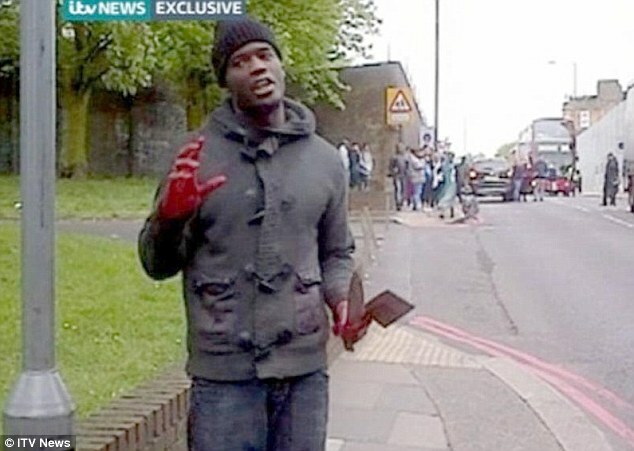 Before police arrived the man identified as Adebolajo, said: ‘We swear by Almighty Allah we will never stop fighting you. The only reasons we have done this is because Muslims are dying every day. 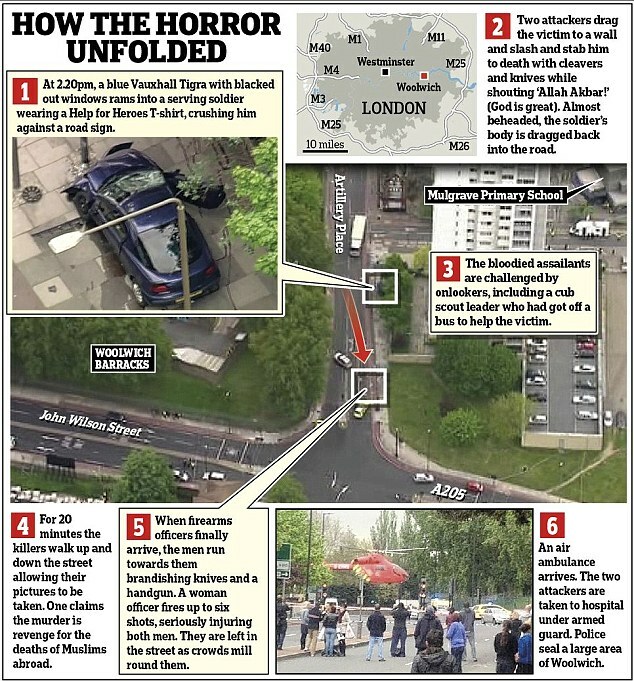 Yesterday’s slaughter took place 200 yards from The Royal Artillery Barracks in Woolwich and close to a primary school at 2.20pm. 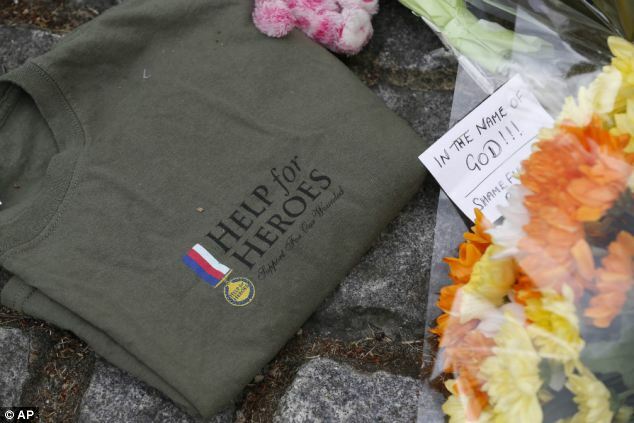 Witnesses told how the men drove a dark blue Vauxhall Tigra on to the pavement and knocked down the soldier. Last night the crime scene remained swarming with police and forensic teams who illuminated the road with spotlights as they examined evidence under large tents. 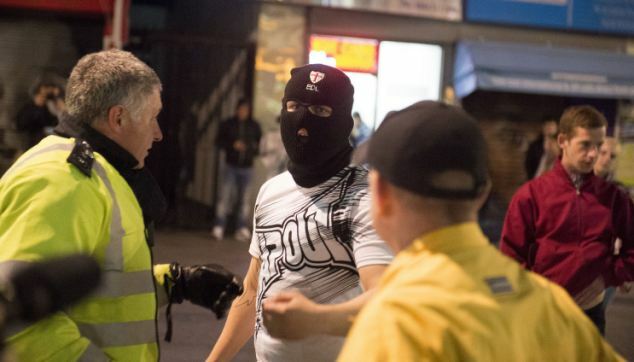 As they worked, more than 100 members of far-right group the English Defence League gathered around the scene, with many draped in St George’s flags and wearing black balaclavas. 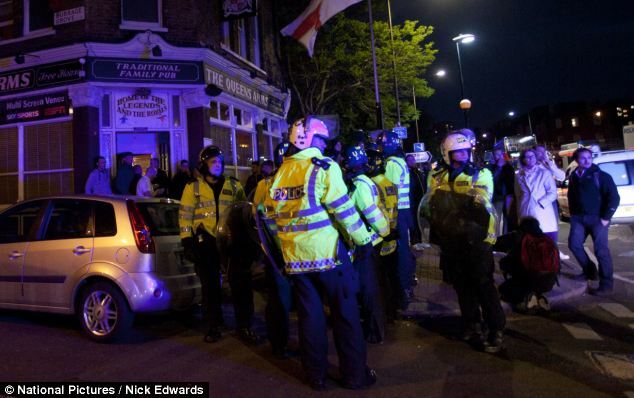 Riot police holding shields formed a cordon around the area as the EDL members waved flags and chanted 'no surrender to the Muslim scum', ‘Rule Britannia’ and ‘England’. Leader Tommy Robinson addressed the crowd, saying: 'We have got weak leadership. They have allowed this to happen. People are scared to say the word Muslim. They are scared to offend them. They marched threw bottles at police before being dispersed by officers by 11pm. A number of EDL supporters then headed to the local Queen’s Arms pub where they sang nationalistic songs. Onlookers said a brick was thrown through a mosque window during the march. 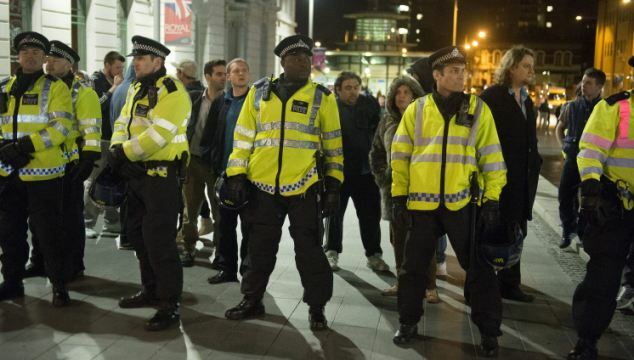 A Metropolitan Police spokesman said he was not aware of any arrests at the protest. Elsewhere, two men were arrested in separate alleged ‘revenge attacks’ on mosques following yesterday’s killing. 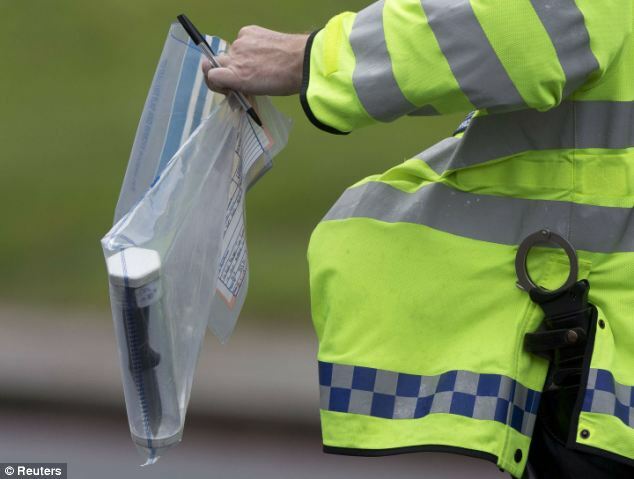 A 43-year-old man who reportedly walked into a mosque in Braintree, Essex, with a knife and an ‘incendiary device’ was arrested at 7.15pm on suspicion of possession of an offensive weapon and attempted arson. The secretary of the mosque in Braintree, Sikander Saleemy, told Channel 4 News: 'The police said it's too early to try and link it to what happened in Woolwich, but those of us who were here feel that it was some sort of revenge attack. It was clear from the man's behaviour. We absolutely condemn what happened in Woolwich, but it had nothing to do with us. And police in Kent arrested a man on suspicion of racially-aggravated criminal damage at a mosque in Gillingham at 8.40pm. Security chiefs and politicians met this morning to discuss their response to the attack. 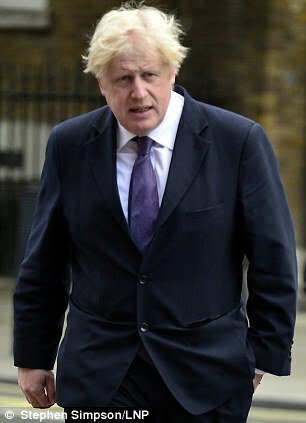 Arriving for a meeting of the Government’s Cobra crisis committee, mayor of London Boris Johnson said it was wrong to link the murder with British foreign policy or the actions of Britain’s armed forces overseas. The mayor also urged Londoners to 'go about their lives in the normal way'. Others attending the meeting included Sir John Sawers, head of security service MI6. Security was tight this morning at the army barracks near the scene of yesterday’s killing. Troops in London were advised in the immediate aftermath of the attack not to wear their uniforms outside their bases. But at the Cobra meeting this morning it was agreed that issuing orders against wearing military uniforms in public would not be the right response to the outrage. 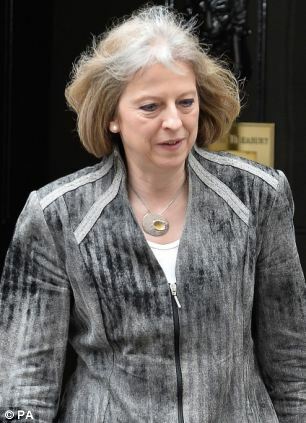 A No 10 source said last night’s advice was an 'understandable reaction' while the circumstances of the attack were still unclear, but Mr Cameron and others at the meeting agreed that 'the best way to defeat terrorists was to continue with normal life'. A Ministry of Defence spokesman said: 'In light of yesterday’s events and the emerging situation, the military chain of command introduced a package of immediate reactive security measures on a precautionary basis. 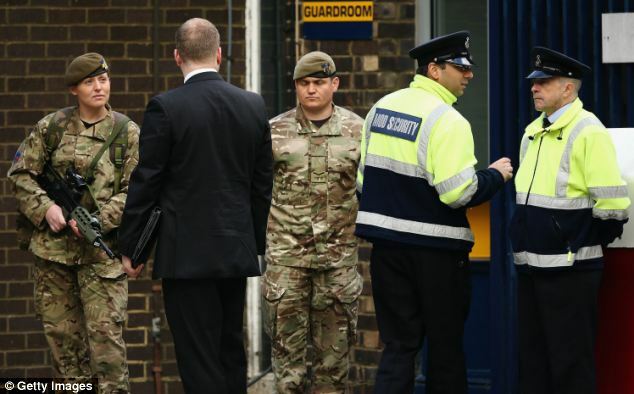 'Following a review of the situation this morning, a decision has been taken to relax some of these temporary measures imposed yesterday, including advice to members of the armed forces in London not to wear uniform outside of defence establishments. Prime Minister David Cameron was briefed by Metropolitan Police commissioner Sir Bernard Hogan-Howe on the murder investigation before chairing the meeting of Cobra at 10 Downing Street. 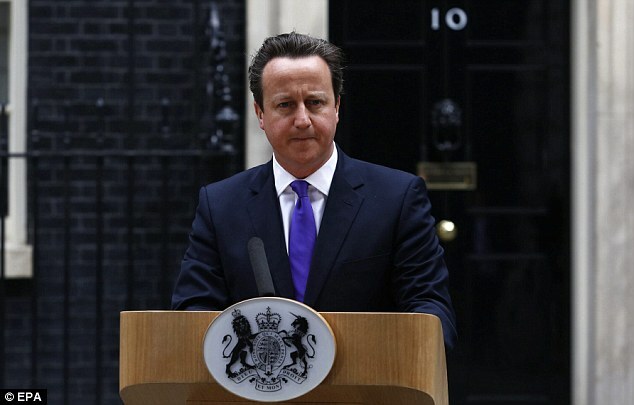 In a message on Twitter, Mr Cameron described the killing as 'sickening'. Meanwhile, a woman who risked her life to confront one of the killers who murdered the soldier in front of horrified passers by described how she tried to calm him moments after the attack. 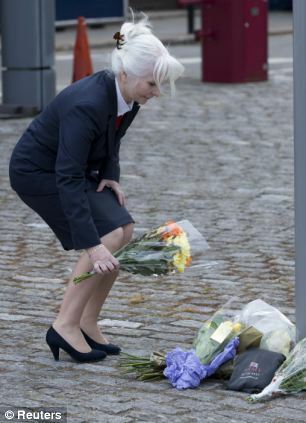 Ingrid Loyau-Kennett, 48, was on a bus heading through Woolwich when she spotted the stricken soldier lying bloodied in the road. Her bravery - and that of others who tried to reason with the killers - has been praised, particularly in the wake of amateur footage from the scene, which shows one of the killers making political statements about the slaughter while still brandishing weapons. Cub leader Ms Loyau-Kennett, of Helston in Cornwall, told ITV Daybreak she initially thought the victim had been injured in a car crash. She said: 'I went to the guy and when I approached the body there was a lady cradling him. And then (one of the killers), the most excited one of the two, said ‘Don’t go too close to the body’. Ms Loyau-Kennett said she tried to reason with the killer to focus his attention away from other potential victims, as large crowds began to gather at the scene. She said: 'I know it’s big today but for me it was just a regular guy, just a bit upset. He was not on drugs, he was not drunk. 'He said ‘Don’t touch, I killed him’. I said ‘Why?’ He said ‘He’s a British soldier. He killed people. He killed Muslim people in Muslim countries’. Ms Loyau-Kennett said her thoughts were to 'just carry on' talking to the man, while several women arriving at the scene tried to shield the victim. She said: 'I wanted him to concentrate on me and make sure he doesn’t have a funny idea. Woolwich and Greenwich MP Nick Raynsford praised the 'extraordinary' bravery of members of the public who approached the killers. 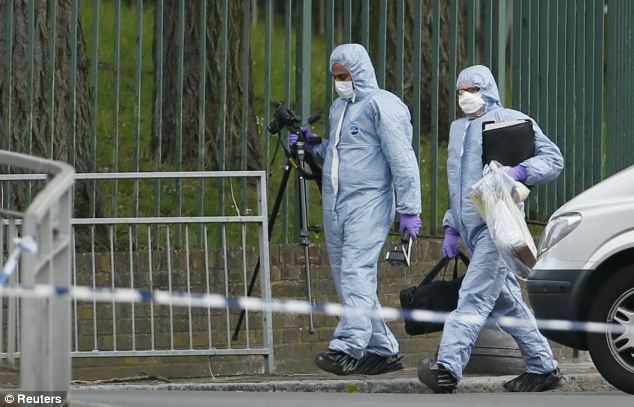 The men are in separate London hospitals being treated for injuries after they were shot by police at the scene.